In March of 2017 I pulled the trigger on my first communal tarantula setup. [Aside] I am not going to mention the vendor I purchased from as I am not happy with them (at all) and want to keep the focus on the subject matter at hand. I have been an active tarantula keeper for over two years, but a fan of all things invertebrate since about the age of eight. Two years ago, life circumstances finally let me decide to go ‘active’ and get involved in the tarantula keeping hobby, as I finally had the time and wherewithal to take care of em’. A little over a year ago I started reading about ‘communal’ keeping, wherein there are multiple tarantulas living in the same enclosure. I had always thought that ‘T’s (and other spiders) were solitary creatures, and by and large, they are…with exceptions, and these exceptions caught my attention. There are several genera/species that take to living together, including multiple species of Poecilotheria, the ubiquitous Monocentropus balfouri and the subject of this post, the Neoholothele genus. The problem for a lot of us in the hobby is expense. The absolute BEST tarantula to keep in groups is without a doubt the M. balfouri, which seems to actually do better together rather than singly. All the others have issues at one point or another, usually eating each other as they grow up, being that they are very territorial and are in nature very cannibalistic. 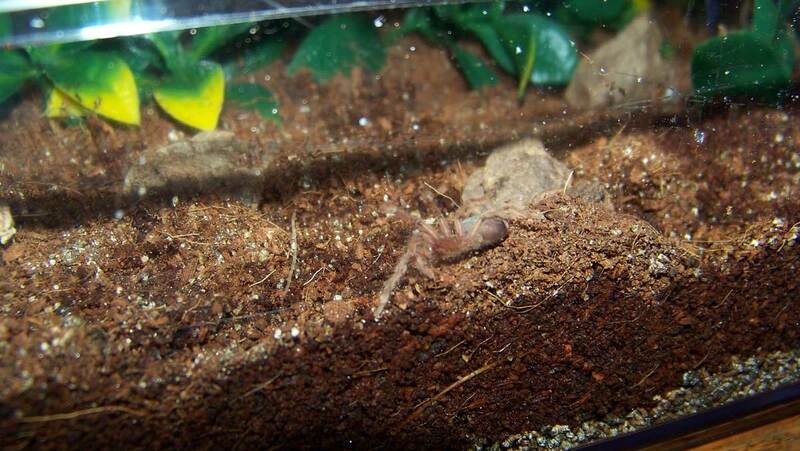 As the M. balfouri is (to date) a fairly expensive purchase, getting 6-12 of them is beyond the budget of most. I thought I’d given up on the idea, and did for a while, jealously watching Tom Moran’s M. balfouri communal update videos as a vicarious way to satiate my interest. THEN (drumroll), I read about the Neoholothele incei species, which seems to get along pretty well together in the main. In the wild, this species has been observed living communally, so I started researching. In captivity I found the results were all over the board as to success or failure. The one thing in common with the ‘successes’ seemed to be the requirement that the group be sac-mates. That is, all from the same egg sac, and in proximity to one another from birth to sale. The other thing that kept rearing its head was enclosure size. As in: NOT as large as one would assume. 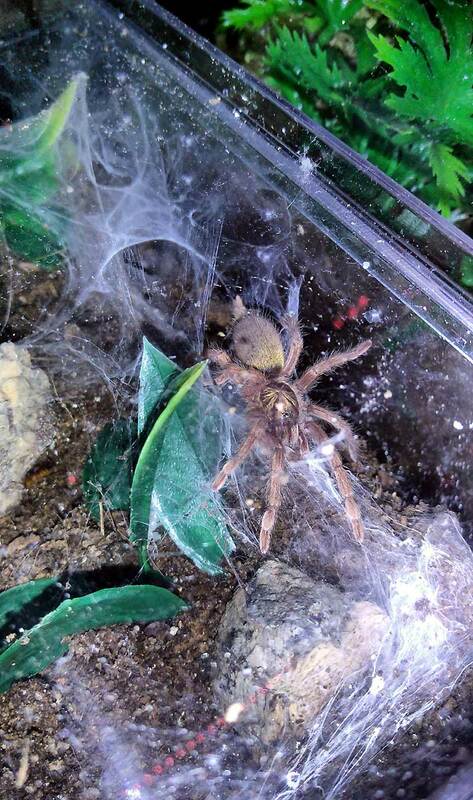 Turns out that the larger the enclosure the more territorial the tarantulas will become, inviting cannibalism if no intervention/rehousing were to be accomplished. Tarantulas are extremely finicky roommates. With all of this in mind, I found an outstanding (read: cheap) online deal for ten N. incei (gold) slings that seemed to fit the requirements I was looking for. I build my own enclosures for the most part, and decided on a ‘Boxbox’ branded plastic case with 3.5″H x 11″L x 7.25″W dimensions as the base. Part of my reasoning for this was due to the number of slings going into the cage, and the other was a minimal ‘re-house’ if things worked out. The N. incei only gets to about 2.5″ for females and 1.5″-2″ for the males, so this will hold them nicely for quite a while. H. incei gold slings upacked. Upon arrival, all ten slings (3/4″) seemed to be in good health, so I housed them and let them go where they wanted. 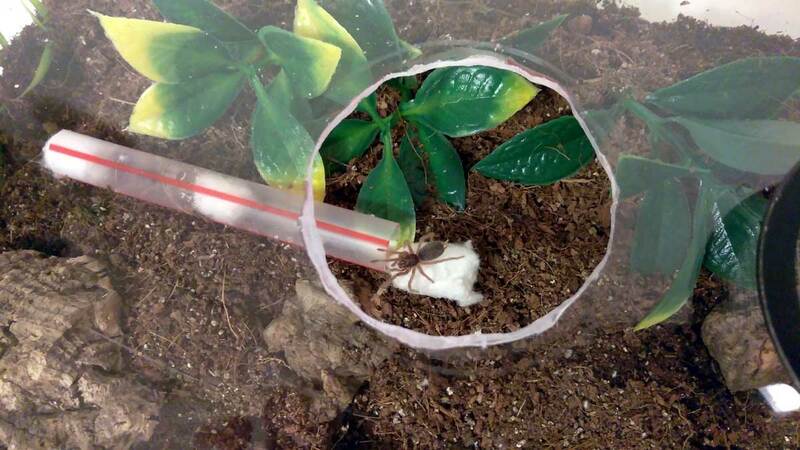 Almost immediately after leaving their shipping tubes, all the tarantulas started setting up shop in the corners and under the plastic leaves. It was interesting to note that when two more or more of them would cross paths, they would start flapping their first leg pairs up and down in an exaggerated way, then begin touching legs with the others before scurrying apart. There were no threat poses or aggressive acts at all during this period. 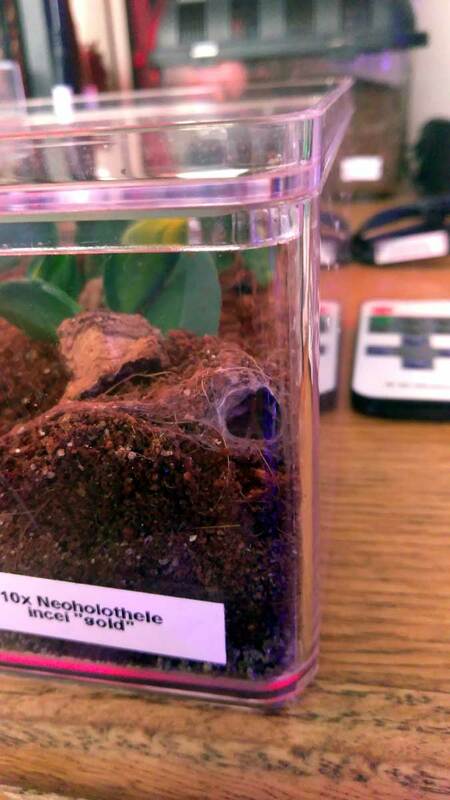 H. incei gold burrow entrance. After this mess, I was left with eight N. incei golds that were beginning to build out their webbing. There were several times that I saw them very close to each other creating web tunnels here and there. This is worth the time and effort just to see it occur. The feeding regimen was originally going to be 15-20 B. lateralis nymphs every three days. After observation of the colony, I backed off to 10-12 nymphs only when I no longer observed prey in the enclosure. [At this point in June, that means I’m feeding about once a week.] While the N. incei do eat, at least in my circumstance, they don’t eat as much as I had expected based on accounts from other Keepers. 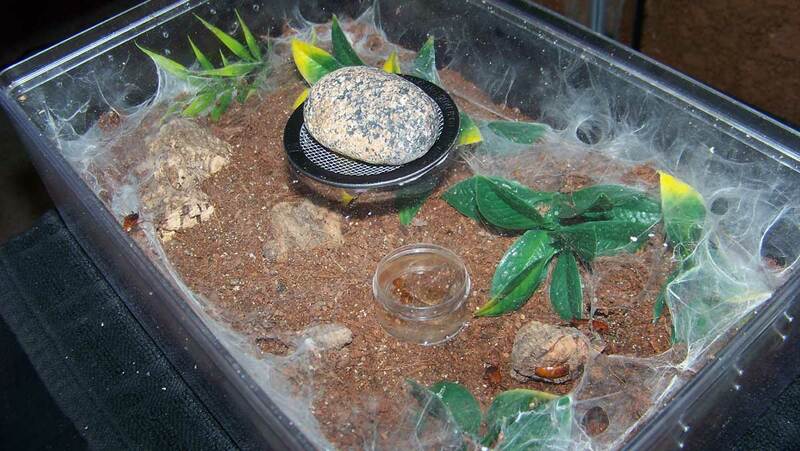 By the middle of May, the enclosure had been burrowed and webbed up pretty well, and this is where things get…boring. The N. incei are, by nature, VERY reclusive. Once things are set up, they tend to stay out of sight all the time. In fact the ONLY way you know you have tarantulas at this point (generally) is that the prey animals that are being fed disappear. Oh, you will see a T moving through webbing occasionally, but getting an accurate count of the colony becomes an exercise in futility. Now in June, I know that the T’s are approaching 1.5″ each, and I have managed to confirm that there are at the very minimum, five survivors. I count 10 burrow entrance/exits, and have seen little to no boluses, so my educated guess is that I have eight healthy little dwarves living their lives. Little to no boluses in this case is not a bad thing. Lateralis nymphs are nearly 100% edible, thus very little waste material is produced. Bolus, the name for indigestible remains of prey, usually happens for larger meals. Wings, parts of carapace and sometimes legs on B. dubia and B. lateralis mature roaches cannot be fully eaten, and the tarantula will wad this up into shiny little waste packets that get tossed away. This also applies to crickets, which I do not use because I personally feel that crickets are the spawn of Satan. It will be interesting as they get larger to see their behavior as the quarters become a bit more cramped, but at this point, I may not have to rehouse this lot at all as the DLS (Diagonal Leg Span) of this species is no more than 2.5″ measured stretched. 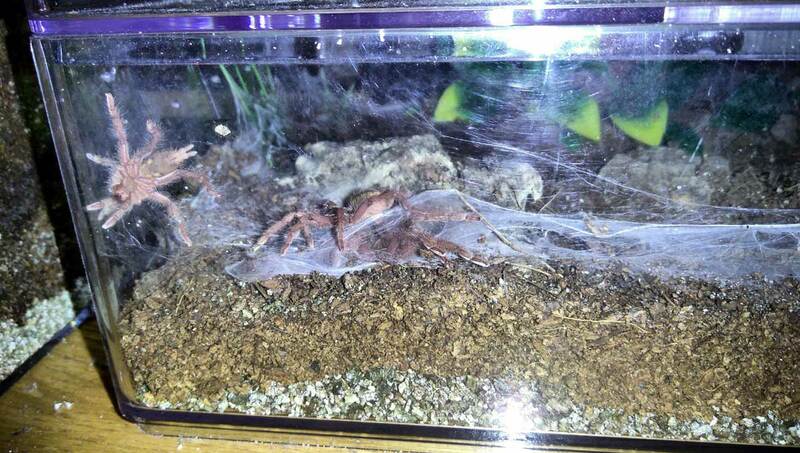 I went over some of this above, but in general I keep this enclosure dry with a communal water dish. I have never seen them drink or go near the water dish except for the first one, which decided the water dish was a great place to pass on to the choir unseen. The Boxbox enclosure (see pictures) has been set up with one 2″ vent in the lid, loose and rock weighted to allow easy access for feeding. There are vent holes drilled at each end to allow cross ventilation. 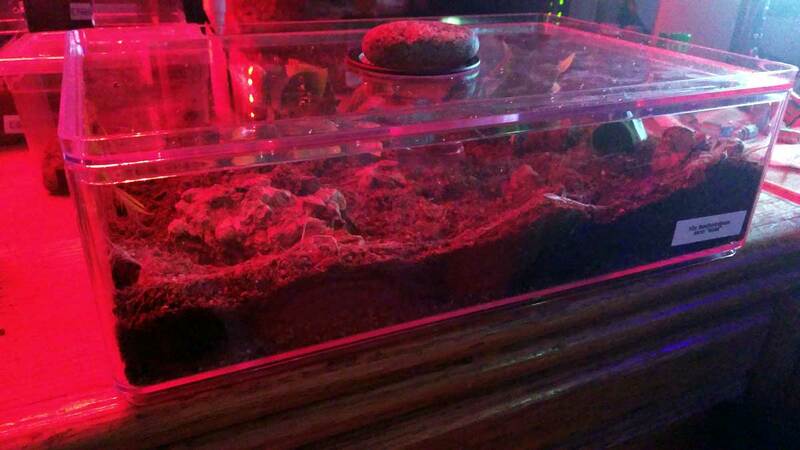 The substrate is a base of moistened vermiculite topped with 2″ of dry coco coir. 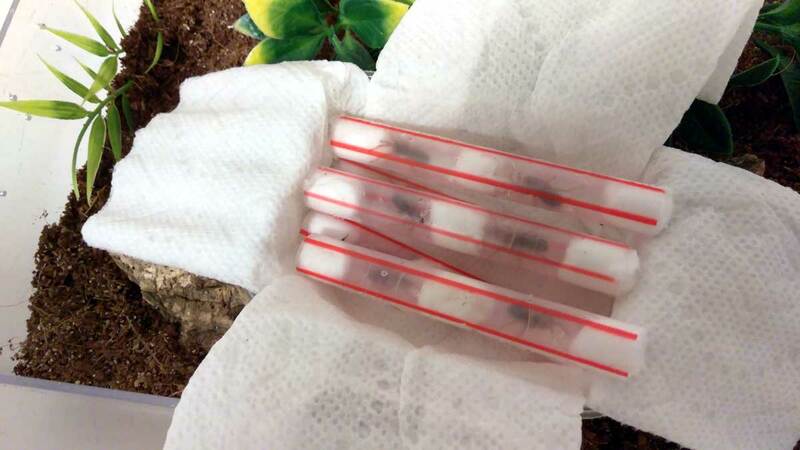 Feeding is 10-15 B. lateralis nymphs (up to 3/4″ in length) approximately once per week. A special thanks to Casey J. Peter for contributing! Check out his blog, “Casey’s Overnight Cafe” by clicking the banner below!